Proper service of our products is extremely important and has pushed us to develop new advances in waterfree urinal technology. Therefore, creating a product that will help make maintenance easier was a primary focus when developing the Velocity cartridge indicator technology. Not only do we strive for a sustainable restroom, with tangible water and energy savings, but we also wish to create a clean and healthy environment for those using and servicing the restroom. We are aware of past issues surrounding maintenance and how messy and tricky things would get when cleaning our urinals. Questions like “how often should I change the cartridge?” or “when was the last time it was changed?” pushed us into developing an easy way to help the folks that service our urinals. Our technology relies on their work to function well and the indicator will now help provide a visual cue as to when it is time for a cartridge change. So what exactly is the indicator you may ask? On top of the new Velocity cartridge you will find a self-monitoring indicator that provides a visual signal that helps you know when it’s ready to be changed. This feature will make maintenance easier and help custodial staff know when to change a cartridge. Making maintenance easy is one thing we strive for at Falcon and innovation has helped us achieve this goal. 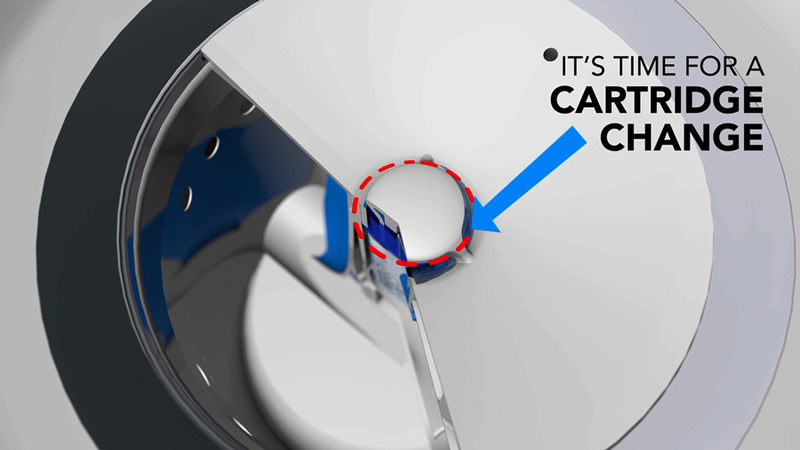 It constantly pushes us forward and helps us develop tools to help you – whether you service or use our waterfree urinal!